Persevering, in Knitting and in Life | Knit Like You Mean It. 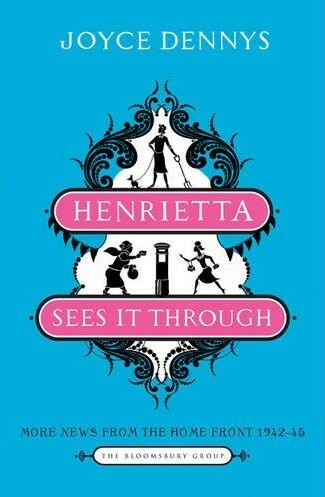 Henrietta Sees It Through, by Joyce Dennys: perfect bedtime reading. We all have times when everything seems, to take a knitting metaphor, tangled and unraveling at the same time. It’s hard to see which end is up or what the next right action is to take. I was reminded of this over the weekend while reading Joyce Dennys’ wonderful Henrietta Sees It Through, which she wrote as a magazine column during World War II. The story is told in letters from the main character, Henrietta, to a childhood friend who is fighting overseas. The wife of a doctor in a small town in England, Henrietta describes her and her neighbors’ war efforts, their fears, their exhaustion, and their resilience. Like The Provincial Lady in Wartime, the two Henrietta books – Henrietta’s War and Henrietta Sees It Through – explore the dark humor of the war effort, and along the way they show the real heroism that Britons showed in simply carrying on, day after day, through long years of war and bombings. Everybody looked at my knitting in silence. It was slightly grey from repeated unravellings, and not in the least like a baby’s bootee, or anything else. “You must persevere,” said Lady B. “The only thing with that sort of knitting on two needles is to follow the directions blindly. Sometimes it suddenly turns out all right,” (p. 89). We’ve all had that moment of thinking our knitting is a complete disaster, and it could never come out right. One thing I like about teaching is that I get to reassure my students, “You don’t have to rip it all out. You’re right on the verge of seeing how it all comes together.” I think knitting is one of the first places where I learned that sometimes you just follow the instructions blindly and hang in there for the miracle. That’s been true in so many areas of my life, and I’m grateful that I got to learn about it from knitting first. Now, I’m not suggesting that my life is anything like that of a woman struggling through a six-year war that included countless tragedies and horrors. Nor am I even suggesting that struggles in knitting are anything like as difficult as our struggles in life. What I am suggesting, though, is that we don’t always see the end when we’re in the middle, and sometimes it’s comforting to be reminded of that. Some days, my knitting reminds me that I didn’t write my life’s pattern; I’m just following the directions through to the end. What a wonderful blog post! You are a fantastic writer. Love it here. Thank you for your good work. “Sometimes it suddenly turns out right.” Good advice in knitting and in life. Have you ever read Dorothy Canfield Fisher? I just discovered her books and she is a wonderful writer. She lived abroad during WWI and did relief effort. Her novels are good but her best work, in my opinion, is her wonderful short stories. I love “The Bedquilt and other stories”. She writes about ordinary people who aren’t really so ordinary and also about people during the wars who persevered with great courage. It’s good to be reminded of these stories, because my trials in beginning knitting are nothing in the grand scheme of things. Love your blog so keep up the good work. Oh, I haven’t! Thank you for the recommendation – she’s going onto my list right now. Have you read The Diary of A Provincial Lady, by E.M. Delafield? Pricelessly funny. Thank you for the recommendation! I just ordered it for $4.95 from my favorite used book site: http://www.betterworldbooks.com. Let me know what you think of Dorothy Canfield Fisher. As I said, I like her short stories better than her novels — she packs more into a short story than many novels. I look forward to hearing what you think of E.M. Delafield…we’ll have to start a book group at fibre space!